It’s no secret that buyers are looking for the very best now when it comes to safety and connectivity technologies. It’s no secret that buyers are looking for the very best now when it comes to safety and connectivity technologies. And that’s why GM is rolling out OnStar on most of its new vehicles, including vehicles that are affordable and within reach of most budgets. The idea here is that GM doesn’t want to make safety and technology too exclusive, and thus feels that regardless of which GMC, Buick, or Chevrolet vehicle you have purchased, you have the right to take advantage of everything OnStar has to offer. And there is quite a bit. For starters, OnStar is designed to keep you safe by providing assistance should you need it, even if you are not able to ask for it yourself. Indeed, OnStar can detect if you have been in an accident, and provide assistance to you remotely. 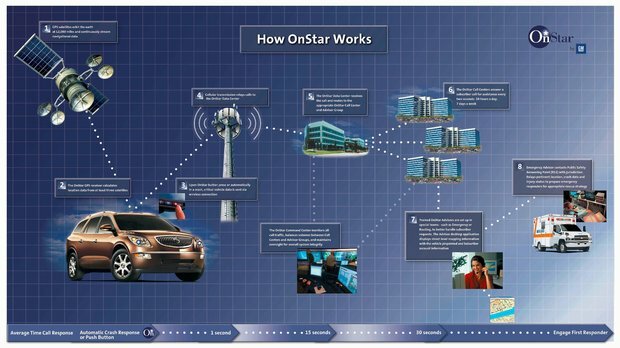 Also, OnStar is there to help if your vehicle is ever stolen by providing exclusive features such as the ability to prevent the engine from starting up after your vehicle is declared stolen, or even slowing down the vehicle when it is being chased. Not only do these features help recover a stolen vehicle faster, they also prevent the vehicle from being stole as thieves know not to mess with OnStar. OnStar also provides a wide range of connectivity features as well, starting with available advisors that can help you find your way if you are lost by sending turn-by-turn directions directly to your navigation system. Better yet, they can even log on to Priceline.com and book a hotel room for you! Finally, one of OnStar’s most impressive features is the 4G LTE Hotspot which allows you to browse the web using your GM vehicle as a hotspot. You won’t ever have to worry about overusing your data plan, or how to get online when you visit the U.S.
To learn more about OnStar, contact us today at Vickar Chevrolet!